Yes, we were with her! We are friends She also bought us presents and we thank her very much, so sweet of her! Hello girls! I'm here. That was an amazing day!!! I will make a photo album. My husband took many pics, but aren't great every picture. So you need to wait because I will select. I had no time today my husband , family are very patient with my passion, but I was very busy today. And probably I will be busy tomorrow. I enjoyed every moment yesterday. The Romanian girls are very cute, and nice persons. I was happy with them! They were lucky they went to backstage after the show but we came home yesterday night. I will write a report. Last edited by lala630312 on 11 Dec 2016, 04:07, edited 1 time in total. This was the most beautiful day in my whole life, I am still ecstatic! I will try to not write too much, because as much as I have to say it would take pages. I arrived there at the arena with my two sisters, Tatiana and Anna. We went there around 15:00 and entered at the rehearsals with the help of a wonderful person from Quantum Media staff (the Romanian organizers), we know each other and this is how we were able to take part in the rehearsals this year and last years also. Now-- Evgeni. He stood beside the ice for quite some time, until they retouched the ice, and he then entered on the ice to warm himself up. As you know, I was a bit worried with him, but I won’t get much into details because I figured out some things, and media and journalists allow themselves to read everywhere and then run and post things they shouldn’t and that aren’t true. 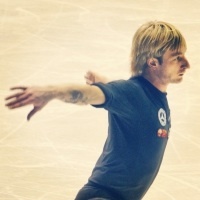 All I can say is that he is definitely in very good shape, he warmed up, he jumped a few triples in rehearsal with no problems. He was all smiles, joking either with Edvin, Ari, so as you know him, a delight to look at. At the show, he let himself waited a lot. 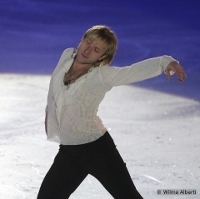 What I mean is that he usually tends to enter the ice either in the beginning or at least in the first part of the show. Now, he didn’t enter in the beginning, nor in the first part of the show. He entered in the second part of the show, after the 15 minutes break. 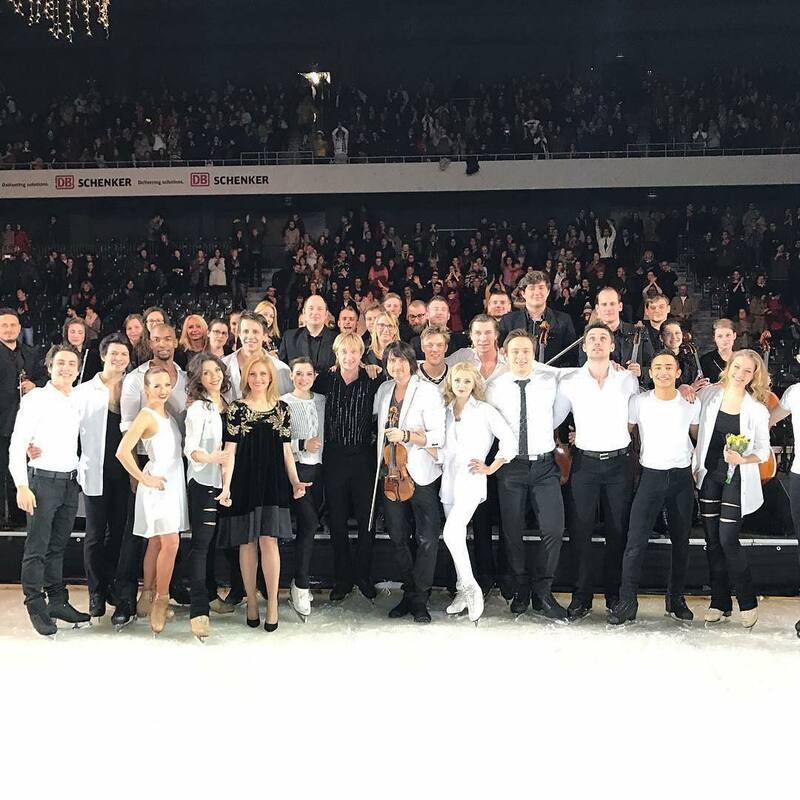 There was so much expectation, you could feel it in the air, people were watching and watching, waiting for him to come on the ice and again Brian Joubert, again Stephane Lambiel, again Tomas Verner, again Florent Amodio, again the pair skaters. The air was getting thick. You could sense people were waiting for him! 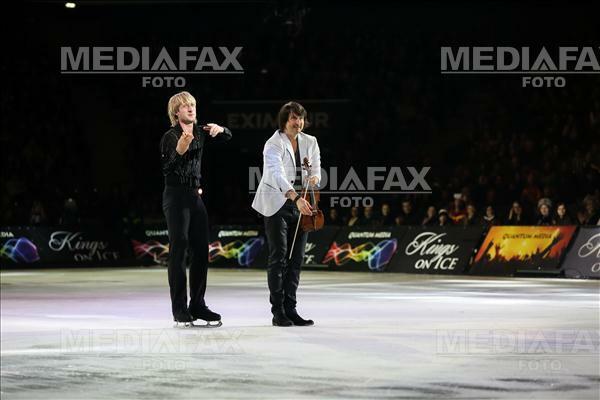 Until the moment he stepped on the ice, looking gorgeous as always, all in black. The entire hall, and I mean the entire hall exploded. You suddenly heard screams and clapping that wouldn’t end, it felt as if we were at a boxing match. He skated “Storm”. Pure perfection, with all his moves, the entire classical choreography, the gorgeous jumps, the crazy footwork. At the end, the hall exploded, he got standing ovations, it felt as if an earthquake happened! Evgeni was overwhelmed, he couldn’t erase the smile from his face, he was shining. As Ari put it “We had standing ovations for “only” 20 minutes”. "Only 20 minutes"! Me and my sisters got him 11 roses each of us, that would make 33 roses. I had white, Tatiana red roses and Anna orange roses. 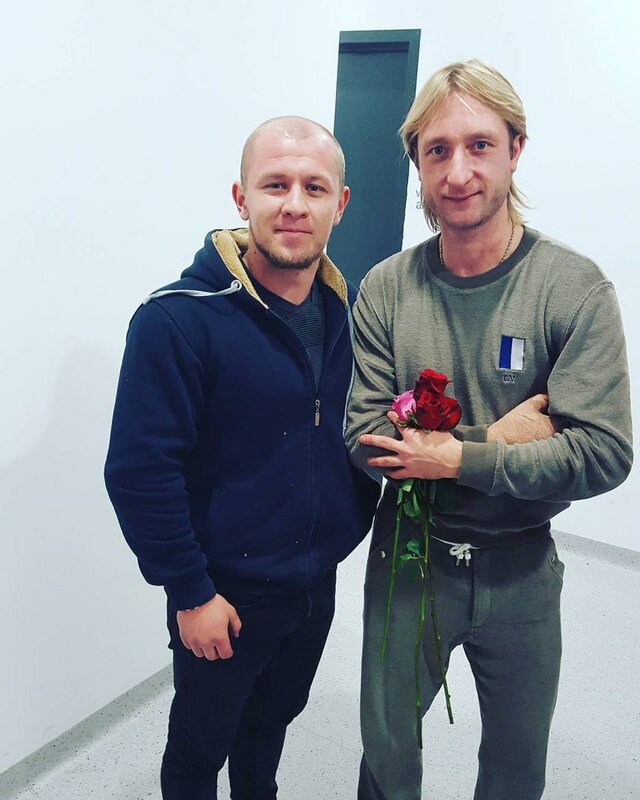 After “Storm” he came to us and we gave him the roses, he was really shining, he came to us saying “Hello! Whoooa!” when he saw the roses, we actually were the only ones who gave him flowers at the end, and they were like 33 roses. He kissed us, we kissed him. I don’t even need to say how gorgeous he is in person, even more than in photos or videos. I don’t care what people believe or say- he is breath-taking. Ari went to Evgeni’s dressing room and told him something in Russian (I don’t know if Ari thought that it was safe because we were Romanian, and he thought we didn’t know Russian, but I actually know Russian pretty well, not everything, but I understand most of it), so Ari told Evgeni that some beauties are waiting for him outside. Ari comes out and tells us “Girls, come with me”. I thought he takes us to Evgeni’s dressing room? I didn’t know. He took us to a separate room, and told us to wait a few minutes here that Evgeni will come to us. So we waited. Ari kept walking around there, running from a side to the other on the hallway, there was no one there besides us, and from time to time Ari came to us telling us “Take something to drink, really, whatever you want!” He is the nicest person! We were waiting there in that room (that we then noticed it was Stephane Lambiel’s dressing room) and we hear on the hallway Evgeni “Giiiirls?” and just before we even had time to make big eyes when we heard him, he entered in the room where we were. Then we took pictures, congratulated him again, he thanked us for the roses, he told us right before leaving “And take care, ok? Take care of you, and a Happy New Year, right? Because it’s coming soon!” Of course we wished him health, to take care of himself. And that was the most beautiful day in my whole life. 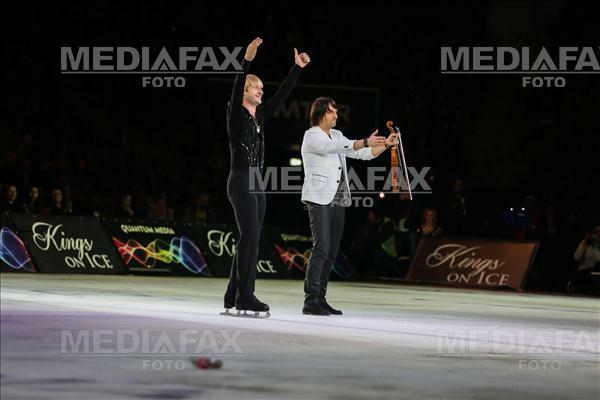 I will post some photos and the two programs he skated. Also from the rehearsal. I just have to take them from my photo camera, I’m working on them. And we also took a picture with Ari because he is the nicest person on earth, and we thank him for everything he did for us. The rest from the show soon! And we were so happy to meet lala630312 again, we know each other since last year, we met at Evgeni's show also in Cluj. Thank you for the presents, it was so nice of you See you again in Cluj next year when Evgeni will come again! Ne pregatim pentru un spectacol exploziv in seara aceasta!